To save time, use a 500g pack of marzipan instead of making it from scratch. 1. Preheat the oven to 180˚C, gas mark 4. Grease and line a 20cm deep, loose-based round tin. Put the vine fruit in a bowl with the lemon and orange juice; set aside. Spread the blanched almonds on a baking tray and roast for 6-8 minutes until turning golden. Set aside to cool then roughly chop. Reduce the oven to 160˚C, gas mark 3. 2. To make the marzipan, whizz the ground almonds and icing sugar together in a food processor. Add the egg yolk, lemon and orange zest and whizz again. Lightly whisk the egg white to loosen it. With the food processor running, gradually add the egg white (you won’t need all of it), until the mixture comes together with a soft consistency. Lightly dust a surface with icing sugar then knead the marzipan for 1 minute until smooth and pliable. Roll ¹⁄ ³ out into an 18cm disc and set aside. Cover the remaining marzipan and chill until needed. 3. Stir the flour, ground almonds, baking powder, mixed spice and salt together in a bowl. In a separate bowl, using electric beaters (or a freestanding mixer), cream the butter and sugar together for 5 minutes until light and fluffy. Beat in the eggs one at a time then carefully fold in the flour mixture. Stir in the mixed peel, lemon and orange zest, chopped toasted almonds and soaked vine fruit with 3 tbsp of the soaking juice. Spoon ½ the mixture into the tin and top with the marzipan disc. Cover with the remaining cake mixture and spread it out evenly, making a slight dip in the centre to give an even rise. Bake for 1 hour-1 hour 10 minutes until the centre is firm and springy to the touch. Leave to cool in the tin before carefully removing to a plate. 4. Meanwhile, for the candied fruit, cut the lemon and orange into 0.2cm slices, removing any pips. Put in a medium pan and just cover with cold water. Bring to the boil then gently simmer for 20 minutes. Strain over a bowl, reserving the liquid. Weigh the liquid then return it to the pan with an equal quantity of caster sugar. Bring back to a simmer, stirring until the sugar has dissolved. Return the fruit slices to the pan and cook for 15 minutes. Line a baking tray with baking parchment, then put the lemon and orange slices on it and leave to set for about 5 minutes. Preheat the oven to 130˚C, gas mark ½, and put the tray in the centre of the oven for 30 minutes to dry out. Set aside to cool. 5. Put the marmalade and a splash of water in a small pan over a low heat to loosen, then push through a sieve and brush over the top of the cooled cake. Roll out ²⁄ ³ of the remaining marzipan and cut into a disc, using the base of the cake tin as a guide. Put the marzipan disc on top of the cake. Divide the remaining marzipan into 11 balls. 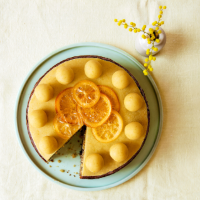 Decorate the cake with the candied fruit and marzipan balls, sticking them on with a little water if needed.